By now most have heard that at our last Council of Bishops meeting in Chicago we received the final report from the Commission on the Way Forward. I want to express my appreciation and thanks for all of you who prayed not only for the Council, but also for the work of the Commission – “Praying Our Way Forward.” I can truly say we would not have been able to complete our work without the prayers of individuals and the churches. It is important to also realize that the work of the Council was guided by a mission, vision and scope that included the following: To design a way for being the church that maximizes the presence of the United Methodist witness in as many different places as possible, allows for contextual differentiation, and creates as much unity as possible. After receiving the report of the Commission, we as the Council of Bishops agreed to submit all three plans (Traditional, One Church and Connectional Conference) to the delegates of the special called session of the General Conference to be held in February 2019. There was strong support in the Council for the One Church plan and this plan will carry the recommendation of the Council of Bishops. I know there will be many questions surrounding this action. Why forward all three plans if the Council is recommending one? To maintain transparency, we wanted to honor the values contained in all three models and to acknowledge that within the Council of Bishops, there is support for each of the three plans. The Council of Bishops believes the One Church plan is the best way forward for The United Methodist Church. We believe this plan allows for contextualization of language about human sexuality in support of our mission. I will be meeting with the conference delegates to the special called session of the General Conference to talk about next steps and providing information for The Annual Conference. I will also be working with each district superintendent to plan opportunities for me to visit each of the districts to hear your concerns and hopes regarding this recommendation prior to the Special Called Session. My prayer is that we remain focused on our mission while continuing to pray for the leadership of the church as we continue to discern God’s will and plan for the church. I look forward to seeing you at Annual Conference. As we continue to follow the unfolding events in Texas with the aftermath and flooding from Hurricane Harvey, I appeal to every local church in New Mexico and Northwest Texas Annual Conferences to take up a special offering this Sunday to support the disaster relief efforts and what will undoubtedly be a long-term rebuilding exercise. I want to encourage pastors and laity alike to prayerfully consider what God would have us do in this time – Leslie and I have already made our contribution to this worthwhile effort and continue to be in daily prayer for the many families affected by the storm. Sunday’s special offering can be sent to the Conference Office with “Hurricane Harvey” in the memo line and will be passed along to the relief efforts through the United Methodist Committee on Relief (UMCOR). I also urge churches to share the online donation portal for UMCOR’s disaster relief efforts through your bulletins, newsletters, and social media (100% of those contributions go directly to support relief efforts): click here. We are a generous people and, at times like these, we can demonstrate the power of our connection by rallying to support the many needs of our sisters and brothers dealing with this tremendous storm and flooding. Please continue to be in prayer for those who have been impacted by the storm and the flooding and especially those working to provide relief. Looking ahead, another appeal for flood buckets, health kits, and (especially) work teams may be forthcoming, but in the meantime, fervent prayers and generous financial contributions are the best way for us to mobilize. 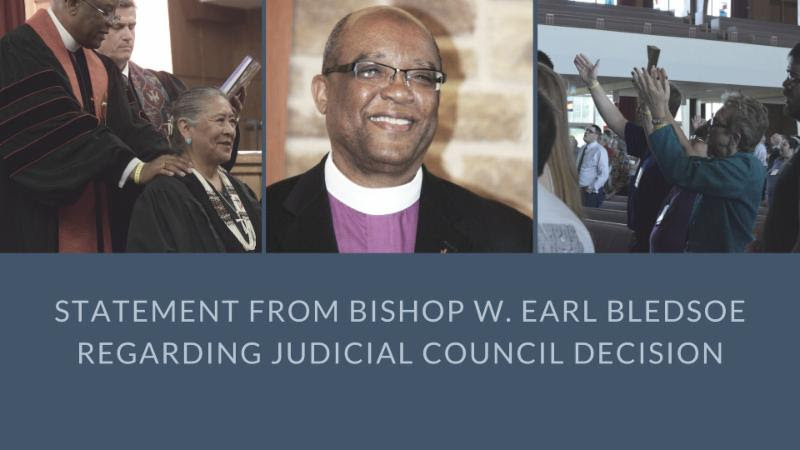 By now, most if not all of you have heard about the recent decision of the Judicial Council regarding the nomination, election, assignment and consecration of an openly gay bishop in the Western Jurisdiction. This decision was in response to a request for a declaratory decision by the South Central Jurisdiction, of which we are members. It is the expressed authority of each jurisdiction to elect bishops of the church. There are five jurisdictions within the United States. The Judicial Council ruled that the consecration was against church law; however because of jurisdictional authority, stopped short of ruling on the other matters of nomination, election and assignment, pending the completion of an administrative or supervisory complaint process. In the United Methodist Church all clergy are entitled to due process under church law. It is my understanding that there are several complaints in process regarding the actions in the Western Jurisdiction and until that process is complete, no decision can be made. I want to ask that all of us remain calm and continue to focus on the mission of the church. Some things are out of our control and hands. We have processes and methods in place to address this issue. We also have a recently appointed Commission that is meeting to present a report in February 2019 to a called session of General Conference to determine a way forward for the church. I hope we will continue to have renewed patience in the midst of our differences and difficulties. The 2016 Book of Discipline has not and did not change regarding the issue of human sexuality. As your assigned bishop, I took a vow at my ordination as clergy and also at my consecration as a bishop to uphold the order and discipline of the church. I intend to do that and keep my commitment with grace and humility. The District Superintendents join me in this commitment to uphold The Discipline. I’m asking each of our clergy, as well, to remember your ordination vows and to continue to lead in a Christ-like manner as we seek a way forward in the church. I want to thank all the churches and individuals who committed to pray for the church and ask that you continue to pray for the church. It is through prayer and fasting that we are able to be sustained and nurtured in the midst of adversity. Did you know that professions of faith increased from 2013 to 2014 in Northwest Texas? Did you know that our worship attendance increased as well? That is great news and I believe we are beginning to turn a corner! I appreciate all of the work that the churches in NWTX are doing to “make disciples of Jesus Christ for the transformation of the world.” You are faithful people and dedicated to fulfilling the mission of the church. It is a blessing for me to be your bishop. I would like to say a special word of appreciation for those churches that have given 100% of their shared ministries and to those that have increased their giving. I expect all churches to pay 100% because that is the best way to accomplish the work we are called to do together. Our local churches and conference leaders have done their part in terms of following through on a 3-part plan. More local churches are giving 100% and many churches are stepping up their giving by 10% each year. From 2012 to 2014, the conference budget was reduced by more than $1 million in order to help all sizes of churches increase their participation in shared ministries. Also, in 2015, the adopted budget is $150,000 less than the prior year. As Dave Andersen, our Conference Treasurer, likes to remind us, “this is not really about money; it is about ministry.” I agree. It is about our mission. Remember that our support of Shared Ministries allows us to be about our mission. Every United Methodist Church across the globe is working on our common mission. aligning resources with our mission. These are four broad, effective, ways to make disciples of Jesus Christ for the transformation of the world. Accordingly, we will move forward with this Kingdom work and we will give 100% in all we do. I have learned a lot as a bishop of the church. I have visited many of your churches and I have heard some of the concerns of the people called Methodists. My hope and prayer is that we in the New Mexico and Northwest Texas Conferences will not let one issue divide us or distract us from the mission of the church. Our congregations are striving to fulfill the mission of the church and are working to enable their outreach to be relevant, passionate, and life-changing in their communities. I hope that we would stay focused on the mission. As bishops of The United Methodist Church, our hearts break because of the divisions that exist within the church. We have been in constant prayer and conversation and affirm our consecration vow “to guard the faith, to seek the unity and to exercise the discipline of the whole church.” We recognize that we are one church in a variety of contexts around the world and that bishops and the church are not of one mind about human sexuality. Despite our differences, we are united in our commitment to be in ministry for and with all people. We are also united in our resolve to lead the church together to fulfill its mandate—to make disciples of Jesus Christ for the transformation of the world. As we do so, we call on all United Methodists to pray for us and for one another. Please know that this is a true statement concerning where the Council stands as a whole on the matter of human sexuality and not a position statement with regard to the issue. The Council of Bishops is made up of active and retired bishops from around the world. Each Episcopal Area is very different. In other words, one statement will not satisfy the needs and concerns of all the diverse areas where The United Methodist Church exists in the world. Thus, I wanted to speak directly to the churches in our conferences concerning the matter. Please be aware of external groups working to try and influence the decision-making process of The United Methodist Church on this issue. These groups are autonomous and receive their support from those willing to donate directly to their specific causes; they are not official decision-making groups of the church and they are not supported by shared ministries. The only group that can speak for The United Methodist Church or change the position of the church on this matter is the General Conference, which meets once every four years. General Conference will be the decision making body that will officially determine the UMC’s position on many issues in 2016 and beyond. In the meantime, I would hope we would not be deterred by any external group wanting to influence the outcome prior to the church actually making a decision – let’s keep focus on disciple-making. Those who choose to violate the Book of Disciple and those who choose to withhold financial support from the church, because of positions outside the bounds of the Book of Discipline, do harm to the church. My prayer is that we do no harm. Finally, I would encourage us to not judge or condemn one another because of differences on this issue of human sexuality. I am of the opinion that nothing can separate us from the love of God made known through Jesus Christ. I look forward to addressing these issues as we work to accomplish our mission. Please continue to pray for the church and for its leadership! 90 Days of Prayerful Determination & Galvanized Intentionality! Imagine my delight, after being assigned your bishop, to discover the five areas of focus you had already embraced. They are totally consistent with my conviction and passion! We have only three months to make bold strides on each one of these emphases. The blessing is that these three months are the most fruitful months to make major advances in all of these areas. Professions of faith. We must, we can, invite persons to Christ, not someday, but now! Pastors, partner with your laity to make major gains in this area. If we don’t exist to bring persons to Christ, why do we exist? Worship Attendance. Worshipping the living God in the congregation is an awesome environment for the work of the Holy Spirit. Concerted efforts must be undertaken to reach the inactives and the infrequent attendees. Urging persons to be in worship to encounter God’s call, be enriched in faith, grow in discipleship, and develop “holy habits” is a proper and sacred endeavor. Shared Ministries. These ministries enable congregations to connect with mission fields and settings of need, both nearby and around the world. In 2011 the Northwest Texas Conference congregations paid 67% of their Shared Ministries. We have major work to do in this area. I have asked the District Superintendents to meet with pastors and lay leaders (and I am ready to do the same) to address the “blockages” that prevent us from moving this year (2012) to at least 80% payout. The expectation is that EVERY congregation will move as quickly as possible to 100% payment of Shared Ministries. For the nearly 50% of our churches who yearly pay 100% of their Shared Ministries, “thank you” for carrying the load for the rest of us. We are grateful! Engage the Mission Field. In every community in Northwest Texas there are children in poverty, teen pregnancy, urgent needs for workplace training, and health concerns for all ages. Our congregations are in the midst of the mission field! In fact, God is waiting to meet us there. We deprive our people of “grace upon grace” when we fail to urge them, yea, lead them like a shepherd into the fields of human need. Culture of Giving. The “culture of scarcity” has no legitimacy in the Northwest Texas Conference. When the Biblical guideline of the tithe is held before persons, this guideline relates only to what we have, (even the widow’s mite), not what we wish we had. There is a great joy in giving! There is a great joy in tithing! When persons pay the tithe first, they experience blessing and financial clarity as they live on the remaining 90%. Such a blessing is left undiscovered when the effort is made to pay the tithe from the leftovers. It seldom succeeds. My sisters and brothers, 90 days is an incredible amount of time to move forward into some remarkable, even long delayed miracles in our congregations. Let us unite our hearts in prayerful determination! Let us unite our wills in galvanized intentionality! Let us partner with God and our people for holy accomplishments! I believe we are about to live the miracle as persons are brought to Christ, people gather in worship, shared ministries really do become shared giving, the poor are fed and the ill-clad have clothes, and people begin to experience the blessing of tithing. May God bless us and help us to fulfill this ministry. Posted in Uncategorized | Comments Off on 90 Days of Prayerful Determination & Galvanized Intentionality! Words of greeting, challenge and blessing from Bishop Dan E. Solomon, Interim Bishop, along with Bishop William W. Hutchinson, of the Northwest Texas and New Mexico Episcopal Area. Please click here for the link and when the page is opened, then click on the video window for Bishop Solomon located in the upper left corner of the page.